THE relationship between China Communications Construction Co Ltd (CCCC) and its joint-venture (JV) partner George Kent (M) Bhd is understood to be fraying at the seams because of issues. The two companies have a joint venture called CCCC-George Kent JV on a 51:49 basis. The cause of the problems is understood to be the RM1 billion systems work package for the Sungai Buloh-Serdang-Putrajaya mass rapid transit line (MRT2), which the two companies had bagged in August 2016. Sources say the dispute has reached the ears of higher levels at Mass Rapid Transit Corp Sdn Bhd (MRT Corp), which is the developer and asset owner of the multibillion-ringgit Klang Valley Mass Rapid Transit project. Slated to connect 35 stations, the RM32 billion MRT2 covers 52.2km, some 38.7km of which are elevated while 13.5km are underground. As at April this year, 25% of MRT2 had been completed. The first phase, from Sungai Buloh to Batu Kentonmen, is scheduled to start operating in the third quarter of 2021 and be fully completed a year later. Without any replies from George Kent, it is difficult to gauge how issues concerning the contract may impact the company or its RM5.38 billion order book. Meanwhile, CCCC has been facing challenging times in Malaysia. News of problems at CCCC-George Kent JV comes on the back of the Malaysian government suspending work on the RM81 billion, 688.3km East Coast Rail Line (ECRL) project, in which CCCC secured the engineering, procurement, construction and commissioning contract in Nov 1, 2016. It is also worth noting that CCCC, in partnership with China Communications Construction Company (M) Sdn Bhd, might have been one of two companies shortlisted by the Barisan Nasional government for the construction of the RM45 billion MRT3, which has since been deferred. George Kent has seen better times as well. Its chairman, Tan Sri Tan Kay Hock, who controls 42.21% of its equity, is known to be a close associate and golfing buddy of former premier Datuk Seri Najib Razak. Some say George Kent’s success in recent years was the result of strong political connections, among others. Its fortunes changed when, from dealing in water meters and trading at 15 sen, the company diversified into rail construction, largely through joint ventures. In August 2012, via a JV with Lion Pacific Sdn Bhd, George Kent won a RM955.84 million contract for the Ampang light rail transit project from Prasarana Malaysia Bhd. And in a tie-up with Malaysian Resources Corp Bhd, it secured the role of project delivery partner (PDP) in the RM9 billion LRT3 that links Bandar Utama to Johan Setia, among other lucrative, large rail jobs. George Kent’s stock hit a record high of RM4.36 on March 15 this year, buoyed by the many rail jobs it was said to have won. Earlier in the year, before GE14, RHB Research and Hong Leong Investment Bank Research had “buy” calls on George Kent and target prices of RM5.19 and RM5.66 respectively. 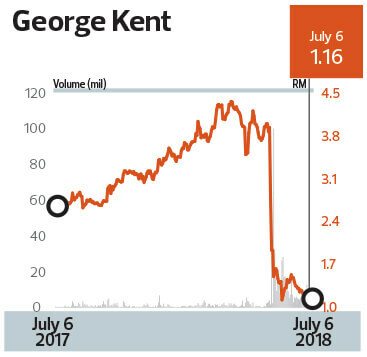 However, since the BN government was toppled, things have taken a turn for the worse at George Kent, and the market has reacted to the uncertainty surrounding the company. The stock closed at RM1.16 last Friday, having shed about 70% since GE14. The sell-down in George Kent can be attributed to its weak earnings prospects. To recap, George Kent had formed a consortium with MMC Corp Bhd and Gamuda Bhd to challenge CCCC and China Communications Construction Company (M) for the MRT3 project. And in partnership with four European companies — Siemens, Alstom, Ferrovie dello Stato Italiane (Italian state railway) and PORR AG — George Kent was looking to bid for the asset company role in the KL-Singapore high-speed rail project, which has also been shelved. With its future projects more or less gone, most market watchers and analysts were banking on CCCC-George Kent JV’s MRT2 contract to maintain its earnings. Now, even that seems to be in trouble. In its first financial quarter ended April 30, 2018, George Kent registered a net profit of RM21.53 million — a record — on revenue of RM99.76 million. In the previous corresponding period, it had raked in a net profit of RM18.5 million on revenue of RM129.42 million. While its outlook appears dim, George Kent had cash and bank balances of RM396.74 million as at end April this year while its short-term and long-term borrowings stood at RM51.01 million and RM2.21 million respectively. Retained earnings amounted to RM257.95 million. On its prospects, George Kent, in notes accompanying its 1Q results, says its outstanding order book of RM5.38 billion will continue to provide earnings visibility in the medium term, and that the group remains optimistic about the rest of the year.